Heidi Sigrsdotter | Azazel's Bitz Box. This statuesque lass represents two things – firstly, my own participation for Morikun’s Competition celebrating the 1,000,000th visit to The Temple of Morikun blog. As well as (obviously) another Jewel of July for my own painting challenge. Now I’m not usually one for painting competitions these days. 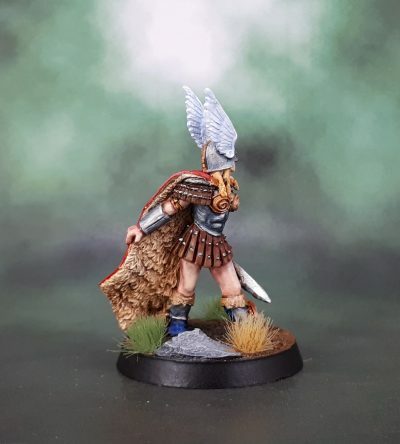 I have actually won a couple in the (distant) past, but the quality of competition these days is through the roof – and I’m rather pragmatic about painting competitions. If I don’t think I have a chance of winning, I don’t bother entering. I’m also realistic. I ain’t winning no Golden Demon or Crystal Brush. And so I don’t enter competitions. And I’m perfectly okay with all of that. Morikun’s one is a little different, in that there are roughly one billion prizes, so rather than feeling like it’s unpossible, it is actually quite possible to win some small thing. 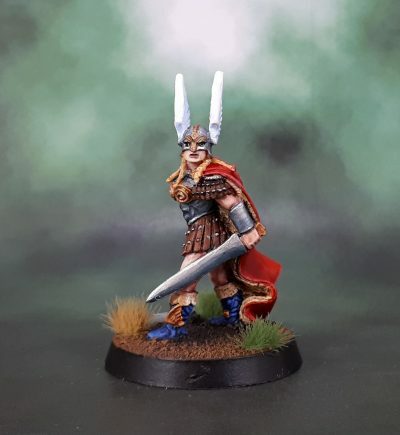 And with that, it feels more relaxed, more like a painting challenge – and as any reader of this blog knows, I’m definitely up for a painting challenge. There are other very cool challenges and competitions out there right now, with some bloody amazing work towards them, but I don’t feel that I have the time for complex kitbashes and conversions right now or anytime soon, so my participation in those is limited to just enjoying the posts and photos that they’re composed of. 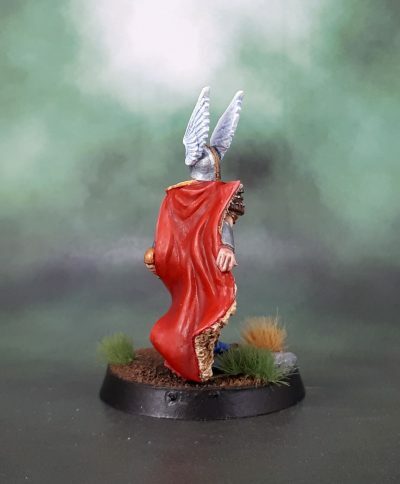 A bit annoying that the highlights and shading on the red of the cape haven’t turned out fully in the photos, but such is life. Anyway, the theme of Morikun’s competition is that of Ms. Morikun, represented by a feminine figure. I can get behind that, though I’d personally be dedicating my own model more towards Marouda, but like is like. 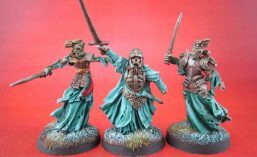 Anyway, the best figures I could find for my oan aesthetic were some of my unpainted metal Adepta Sororitas, or a Shieldmaiden/Valkyrie. 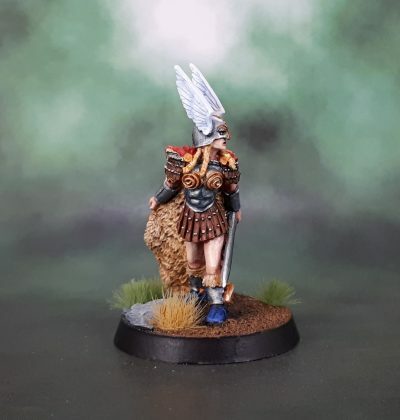 I went through my stash of Norsewomen, and decided to go big, picking out this model, Valkyrie – Heidi Sigrsdotter from Heresy Miniatures that I picked up with my last order to Andy. The colour scheme was something that developed pretty much organically, with no planning – I just went entirely by “feel” on this one. 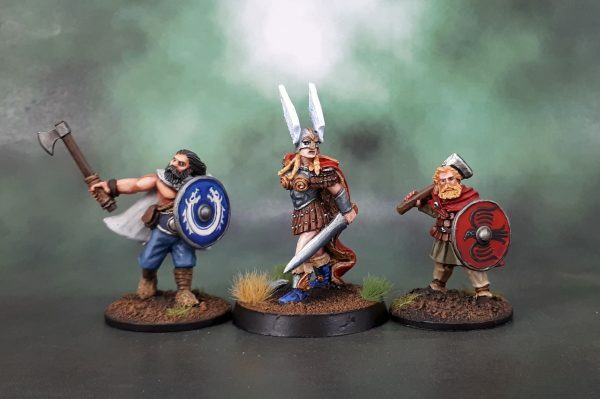 My only real concern was to ensure that the colours were in keeping with my actual viking models. 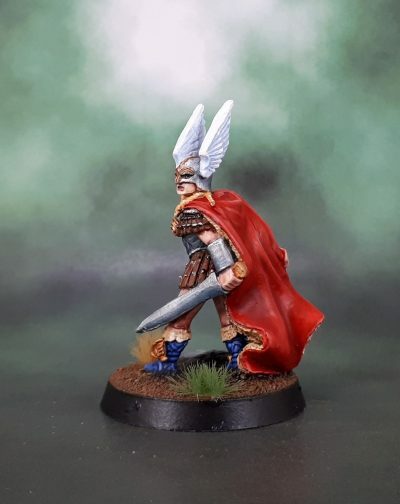 The very “Thor” colour scheme was simply how it all turned out, which I noticed about 3/4 of the way through the model. Given the nature of the model, this was fine by me. One small painted change from the intent of the original sculpt I (sort of) made, was the upper chest. I genuinely thought that the breastplate continued up to under the model’s neck, where the cloak’s neck chain is. It wasn’t until partway through painting when I realised that it was meant to be a kind of comic book superheroine cleavage. So naturally I left it in the metallic colours I’d painted it in to represent armour. She doesn’t need a spear under the collarbone! So here we are – my submission to the Temple of Morikun and also another Jewel of July. July ends in a few hours, but the next couple of posts will be the remaining figures I finished over the final weekend in July, plus anything I manage to complete tonight before midnight.